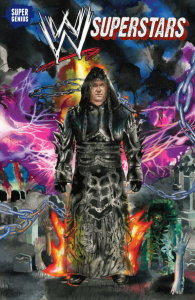 NEW SERIES BY WWE HALL OF FAMER MICK FOLEY HITS COMIC SHOPS NATIONWIDE WEDNESDAY, DECEMBER 11TH! NEW YORK, NY: Super Genius Comics, in partnership with WWE®, will be launching in comic book shops December 11, 2013 with WWE® SUPERSTARS #1, the first in a new ongoing series written by WWE®Hall of Famer and New York Times best-selling author Mick Foley. The series is the first collaboration to come out of a licensing deal between WWE®and Super Genius’ parent company, Papercutz Graphic Novels. The new series is already creating a buzz, with wrestling fans around the country referring to the launch date as “WWE-DNESDAY”. The first issue will be sold with 4 collectors’ item variant covers by superstar creators Alitha (Iron Man, Batgirl) Martinez, also the series’ artist, Dean (The Fox, HBO’s Bored to Death) Haspiel, Michael (Walking Dead, Spartan X) Golden and Jill (Sandman, Scary Godmother) Thompson, with a special limited edition cover by Miran (The Crow, X-Files) Kim in select comic book shops across the country. With extensive online buzz in the wrestling fan community, comic book fans shouldn’t be surprised to find their local shops even more crowded on a Wednesday than usual. WWE®SUPERSTARS #1 by Mick Foley and Alitha Martinez is available in comic book shops nationwide on December 11th, 2013. To find a comic shop near you go to http://www.comicshoplocator.com/ or dial 1-888-COMIC BOOK. Digital copies will be available on a day and date release schedule at Comixology.